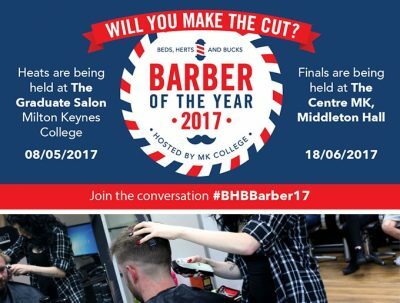 Milton Keynes College is excited to be hosting the third running of the Barber of the Year contest, which is now bigger and better than ever for 2017. In previous years, the contest had only been open to the finest practitioners from Milton Keynes, but this year’s edition will see entries from across Beds, Herts and Bucks as the search for the best local barber spreads further. As in 2015 and 2016, the grand finale of the contest, which has Wahl confirmed as sponsors, will take place at Middleton Hall, centre:mk as part of MK College’s spectacular Festival in the City event on Sunday 18th June. Maria Bowness, Head of School at MK College for Hair, Beauty, Hospitality & Events, is looking forward to the expanded competition. She said: “We’re delighted to see the Barber of the Year being grown in this way. “Since its first year in 2015, the contest has proved even more popular than we first expected, both in terms of contestants and interest on the day of the finals with huge crowds gathering to see the barbers in action. Prior to the final, contestants will need to make the final cut by demonstrating their skills to expert judges at the heats, which will take place on Monday 8th May at The Graduate Salon, located at MK College’s Bletchley campus. Entries for the competition are now open until 28th April – email caroline.bray@mkcollege.ac.uk for application details or to find out more.